An independent publication of the Colorado School of Mines Alumni Association, The Colorado School of Mines Magazine cost 25 cents per copy or $1.50 per year in 1910, a price that held steady for more than 20 years. It measured 9 3/4 x 6 inches and was illustrated on the cover with a rose entwined with an oak leaf. There was only one photograph in the 18-page first edition: a stern image of the football coaching staff, athletic director and team captain. 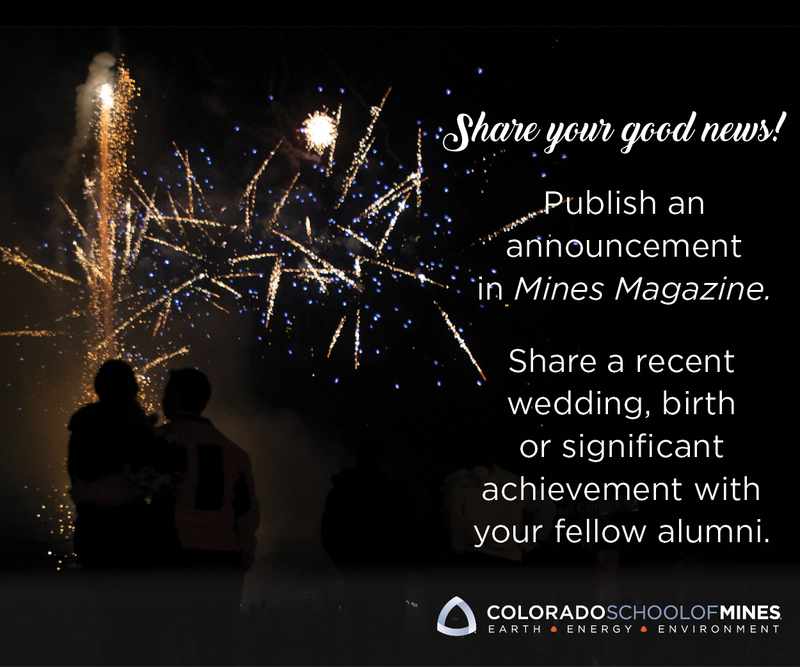 For the ensuing 60 years, The Colorado School of Mines Magazine served the dual purposes of keeping alumni in touch with each other and the school, while also disseminating research and practical information among a highly specialized group of geotechnical professionals. Part industry journal, part community journal, the publication drew strength from Mines’ focused mission. While most college alumni magazines have historically aimed to engage alumni with news from campus, sports, class notes and a handful of general-interest feature articles, Colorado School of Mines Magazine did this and more, delivering practical and often highly technical articles that could have an impact on its readers professional success. Starting in the ’30s, special issues began focusing on specific disciplines such as petroleum, mining and metallurgy. While issues typically numbered about 48 pages, the annual petroleum editions of the ’50s and ’60s frequently exceeded 150 pages, densely packed with long and detailed papers. Launched as strictly a publication of the Colorado School of Mines Alumni Association, the magazine’s relationship to the school has gone through a number of changes over the years. Published with frequent messages from the school president and run from offices on campus, The Colorado School of Mines Magazine started out with close ties to the school. However, in 1920, a conflict between the administration and the magazine resulted in temporary eviction from campus and the resignation of then editor C. Erb Wuensch ’14. In 1928, deteriorating relations precipitated a move to Denver, and it would be 30 years before the alumni association and the magazine (renamed The Mines Magazine in 1932) would come back to Golden. The 1958 return to campus marked a turning point in the relationship, which while turbulent at times, remained fundamentally cooperative through the present time. In fact in 2000, with the signing of a memorandum of understanding between the Colorado School of Mines Alumni Association and the school, Mines Magazine, as it had been titled since 1976, became a jointly sponsored publication under the still more abbreviated title,Mines.To mark the magazine’s 100th anniversary, we offer an abbreviated history in two parts. With about 40,000 pages published, our story of Mines magazine will be gleaned from samplings taken at 10-year intervals: 1910, 1920, 1930 and so on. Part I covers the years 1910 – 1960, Part II, slated for the spring issue, will cover the remaining years. To augment this retrospective, and to enable readers to take their own journey through the last century of Mines magazine, more than 100 issues have been scanned and made available here as searchable PDF documents. Club Notes describes a meeting of the Integral Club in the gymnasium at which Coach Stuart exhorted all those who were physically able to try out for the football team. The reporter writes, “He stated emphatically that he did not want ‘quitters,’ but wanted men with the ‘Mines Spirit. '” The first dance of the season had taken place on September 24, 1910, in Guggenheim Hall, music furnished by the C.S.M. orchestra. Club Notes also points out that the beginning of the school year saw 130 members of the Christian Association and about 100 men were expected to attend Bible Study that year. The second issue opens on a sober note with a meticulous account by W. W. Evans ’08 of the October 8, 1910, Starkville Mine explosion in which 56 miners died. Located near Trinidad, Colorado, the mine was one of the leading producers of coking bituminous coal. With the awareness of one who knows that careful documentation might help prevent future accidents, or inform rescue attempts, Evans describes every step of the rescue, including such technical details as getting fresh air into the mine using a fan ‘driven by a 20-horsepower, direct-current motor, revolving at a speed of 300 revolutions per minute ‘ able to move 50,000 cubic feet of air per minute. He also conveys the human tragedy: how the bodies were brought out and carefully wrapped in canvas and sprinkled with embalming fluid before the foreign laborers would approach the remains of their co-workers. It is a sad irony that Evans died exactly one month after the Starkville tragedy in an explosion at Delagua, Colorado on November 8, 1910, while involved in another rescue operation. He was 24 years old. It’s not the only time that, flipping through early editions of the magazine, one comes across subjects that seem relevant to modern times. A purely technical paper in the September 1920 issue titled ‘Investigation of the Fundamentals of Oil-Shale Retorting’ elicits an enthusiastic response from a reader in the following December issue, whose endorsement of the potential of oil shale relies on the same arguments used today. One thing that has changed since the ’20s is the relationship between the school and the alumni association. Editions from 1920 describe how Mines came under investigation by the American Association of University Professors for various internal academic problems, which resulted in the school being put on a censure list. Responding to this embarrassing turn of events, C. Erb Wuensch ’14, the firebrand editor of the magazine at the time, criticized the school’s board of trustees and administration, going so far as to propose that all public Colorado universities be supervised by a single board of regents. As Colorado School of Mines grew, so did the magazine. By 1930, the 875-member-strong alumni association was publishing a 48-page magazine that measured a more substantial 9 x 12 inches and featured many more photographs. Perhaps in light of the Depression, the cost remained level. That year the magazine reported revenue of $8,188 in subscriptions and advertisements, and expenses of $7,724. Advertising may have been the largest source of revenue; almost a third of the January 1930 issue is taken up with ads, with full pages devoted to companies such as General Electric, Ingersol-Rand and The Colorado Fuel and Iron Company. With the larger format, there was plenty of room left for news and technical content. The February, 1930, issue includes a long and detailed paper titled, ‘Geophysical Investigation at Caribou, Colorado, Relationship of Topography, Geology, and Magnetic Disturbance.’ In the news section, several pages are devoted to accounts of the Jan. 23 Engineers’ Day, including the speech by Henry McAllister, a prominent Denver lawyer, who was welcomed to campus by President Melville F. Coolbaugh. The reporter describes how McAllister’s humorous accounts of ‘mining litigation in the early ’90s’ provoked much amusement and applause from the students and engineers who attended the program. World War II had a profound impact on Colorado School of Mines. The school’s collective contribution to the war effort was substantial, particularly in engineering expertise, and many alumni and others associated with the school made enormous individual sacrifices, including over 100 who lost their lives. In light of this, it’s interesting to note that mention of the war in Europe is conspicuously absent from most of the issues of 1940. Reflecting the isolationist mood of the nation during this time, the first substantial article on the subject doesn’t appear until the October issue, which includes the article ‘Geology and Strategy in the Present War,’ by Douglas Johnson, a geology professor at Columbia University. Interestingly, the apparent silence was broken in October with one of the longest articles published in the magazine all year long, and the November issue features a tank on the cover and includes an article titled ‘Petroleum for War,’ by John N. Shuffler. The magazine tackles another subject in 1940 that had been rarely addressed: women at Mines. In the April issue, Frederick C. Steinhauer ’99 traces the history of the school’s first three women to earn degrees from the school. While Mines was never legally an all-male institution, by 1940 only a handful of women had ever attended, and even fewer graduated. According to Steinhauer, Florence Caldwell ’98 attended Ohio Wesleyan prior to coming to Mines and completing the Civil Engineering degree. She was followed by Grace McDermut ’03, who earned the more difficult Engineer of Mines degree; however, she was unable to find a job in the mining industry after her family’s mine was sold, so she pursued a successful career with the National Bureau of Standards. The third woman was Ninetta Davis ’20, whose degree was also in mining engineering. Following her graduation, Davis worked for the Midwest Refining Company in Wyoming, the Union Oil Company of California, and the Geological Survey. The subject of women at Mines received national attention 12 years later when freshman Nancy Easley, the only female student on campus at the time, appeared on the cover of Life magazine with 900 male students in front of Guggenheim Hall. ‘The Developments ofDirectional Drilling’ by J. B. Murdoch, Jr.
To compile this impressive issue, Bowman was supported by an assistant editor, two staff members responsible for production and circulation, 15 associate editors and 24 section editors. The November 1950 issue includes a full-page obituary for President Emeritus Melville F. Coolbaugh, who led the school from 1925 until 1946. The memorial includes details of his childhood, his distinguished academic career, his service during World War I in the chemical warfare division, and his 26-year term as president of the school, the longest term served by any Mines president to date. The October 1960 publication was the official 50th Anniversary Issue of Mines magazine. The cover is gold and appears to depict a copy of the first issue of the magazine, but it is inaccurate. An original first edition may not have been available to the editors, because the October 1960 cover features an October 1910 cover with the school’s spherical triangles on the cover, a design that was adopted shortly after launching the magazine, but was not used on the first edition. Thankfully both Harvard and the University of California at Berkeley have first editions in their library that were scanned as part of the Google Books program and can now be viewed online. This minor detail aside, it’s a great issue. To alert readers of the approaching anniversary, a gold cover had been used for each monthly issue since April, but the October issue takes the theme a step further by including a wide variety of articles relating to gold, including ‘Gold Forms in Ores’ by Arthur Weinig ’08, ‘The Role of Gold in International Liquidity’ by Oscar Altman, an article about gold mining in the Cripple Creek valley by Max Bowen ’24, and a historical review of gold mining in Colorado by Arthur Mayham. The MINES Magazine has recorded the activities of these men for a half century, and we look forward to the next half century in which The MINES Magazine will continue to play an important part in recording the events of an astounding era. Part II of this Mines magazine retrospective will be published in the spring 2011 issue. In the meantime, visit the newly-designed magazine website at minesmagazine.com to view complete searchable electronic copies of more than 110 issues from throughout the century, including all the articles referenced above.